Where can you kayak in Pensacola? 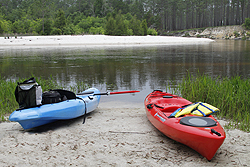 Use this page to discover kayak launches, view maps and discover more about kayaking in Pensacola. Ready to explore the rivers and bayous in the Pensacola Bay Area? From Pensacola, you are minutes from many great kayaking locations from Milton to Perdido Key. The area’s diverse landscape has many rivers, bayous and beaches to explore. We are here to help you discover some of the many kayak locations northwest Florida has to offer. Looking for kayak rentals? View our prices and packages. Southwest Pensacola and Perdido Key has many nice areas to kayak. From Big Lagoon to the Perdido River there are many diverse ecosystems to explore. Big Lagoon State Park – SW Pensacola / Perdido area – This state park located just outside of Pensacola has a nice kayak launch. This is a favorite. You’ll see many birds in this area. The park also rents kayaks. Great article. There is an abundance of rivers in the panhandle and all of northwest florida. The awesome beaches here often seem to override the natural beauty just north of the coast. Definitely worth the effort to venture north and enjoy.. Thanks Kevin! There are so many beautiful areas to explore in northwest Florida.